Backyard Garlic is rooted in New Hampshire. Backyard Garlic is 100% garlic. We grow the garlic ourselves and we buy from local farmers, too. 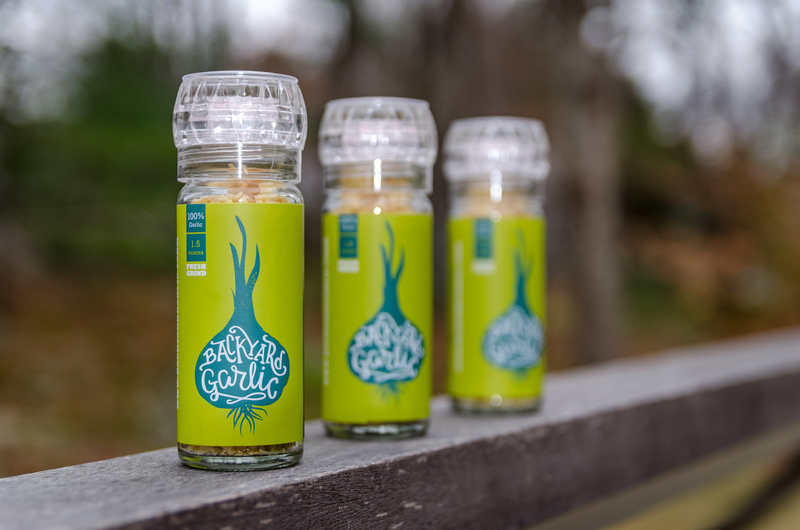 Backyard Garlic dehydrates in small batches to preserve the crisp, robust, delicious flavors of garlic. Sold in grinder-top spice jars and refill bags. Keep a twist-grind jar handy to flavor while cooking or keep a jar the dinner table to grind directly over eggs, salads, breads, vegetable, pasta, soup and much, more more. (Who doesn't like just a little more garlic!) Convenient refills make it easy to replenish your glass grinder anytime.